Apple posted an announcement on Monday warning developers that anyone involved in manipulating App Store chart rankings or user reviews will end up losing membership in the Developer Program. "Once you build a great app, you want everyone to know about it. However, when you promote your app, you should avoid using services that advertise or guarantee top placement in App Store charts." said Apple. "Even if you are not personally engaged in manipulating App Store chart rankings or user reviews, employing services that do so on your behalf may result in the loss of your Apple Developer Program membership." Apple added. The company suggested that developers use the App Store Resource Center in order to "Get helpful tips and resources on marketing your apps the right way." The warning immediately followed Apple's removal of the embattled "Temple Jump", along with a large number of other alleged "clone apps" that were yanked down from the App Store. The practice capitalizes on iTunes users mistaking iOS lookalike games for the popular versions, only to find they've been duped when experiencing inferior gameplay after downloading. Clones pull huge sales away from the originals in order to dubiously rise in chart rankings with the greatest of ease. Developer Anton Sinelnikov had only 9 of his original 68 apps left populating the App Store after being targeted by Apple. His alleged lookalike apps including Tiny Birds, Numbers With Friends, Plants vs. Zombie and Temple Jump were just four of the apps tagged in Apple's clean sweep. 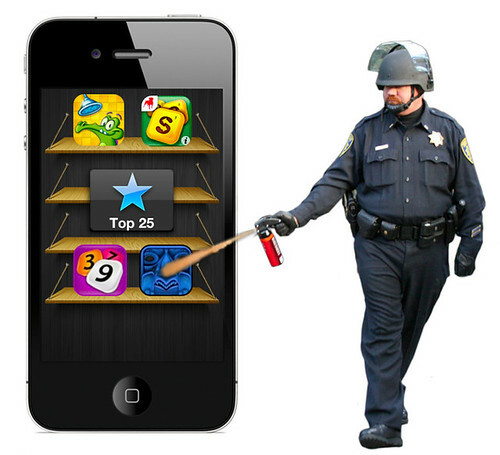 Manipulating App Store rankings is nothing new for iPhone devs, Molinker Inc., became the unwitting poster child of an alleged App Store ratings scam in late 2009, having over 1,100 apps banished by Apple for fabricating 5 star reviews. Some companies have approached iOS developers with a surefire scheme designed to land their apps in the Top 25 rankings for a $5,000 fee, according to a post by PocketGamer. It appears Apple is already wise to the scheme which might explain why a Top 25 graphic was also included next to its posted warning to developers.